You don't need to go scuba diving on a boat ($100 per person) or even go scuba diving. 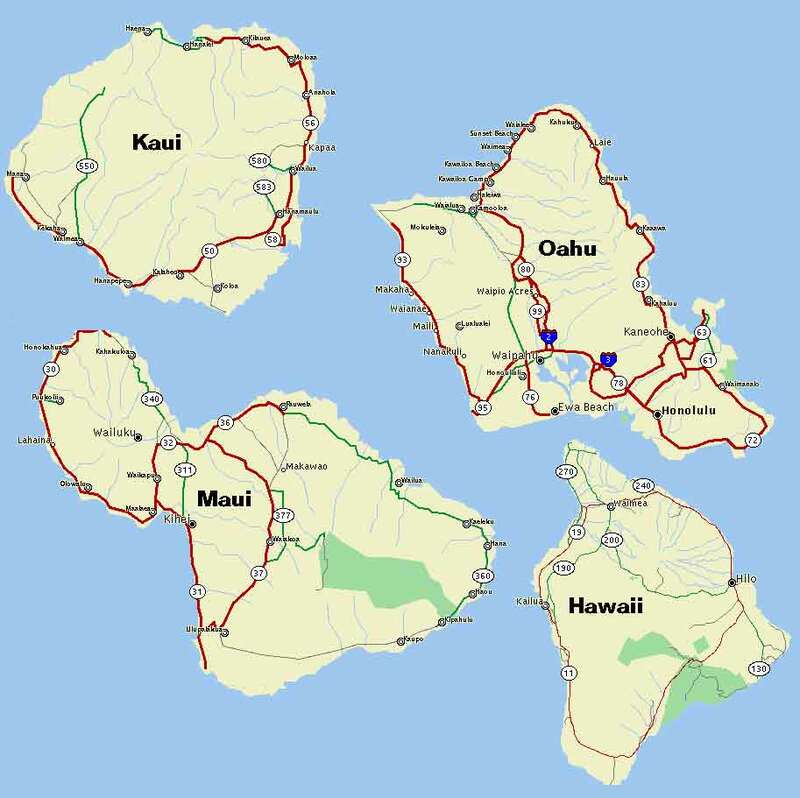 The reefs are close to shore in many places and you can get a good maps that point out reef locations at the Maui Dive Shop. We brought our mask and rented flippers for $10/week. Snorkeling is better in the morning before the trade winds pick up. Water temp was cool, but I only wore a swim suit, and didn't need the shorty I brought. Dinner at nice restaurants cost $20-30 per person. A lot of nice restaurants to choose from. 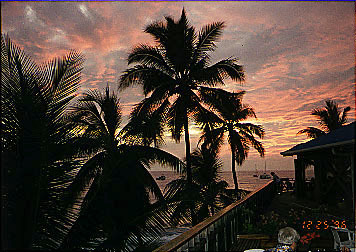 The West side of the island is where snorkeling and diving is good. The end of April is when the whale watching ends. 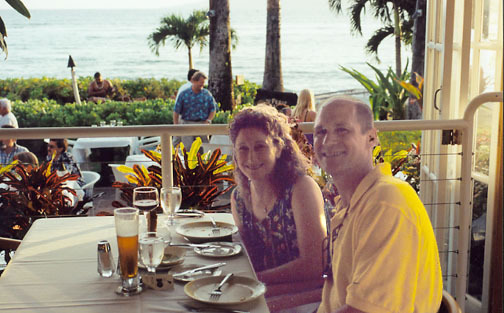 Sandals, shorts and tees were what we wore, except to go to nicer dinning establishments. The temps were in the 70s and 80s. It only rained slightly two days we were there. One last thing, I hear golf is good there. Fri, April 20th - Our flight left Detroit at 9:15am. We stopped to switched planes in Minneapolis at 10:40 (11:40 eastern time). The flight to Honolulu was suppose to leave at 12:40, but left at 2:45 due to a hydrolic leak in an engine. We changed our reservations and when we arrived in Honolulu at 6:30pm (12:30am eastern) got on Aloha Air at 8:00 (2:00am eastern) for the half hour flight to Maui. 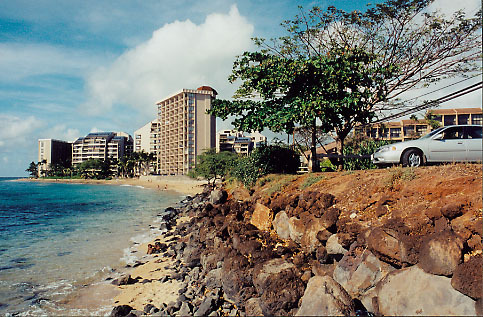 Once in Maui we rented a car at Alamo and got to the Kahana Beach Condo at 10:00pm (4:00am eastern). All told we were travelling for 16.75 hours (2 hours due to delays). Sat, April 21st - Went to Lahaina and walked around. It is a very nice town with a lot of places to eat and shop. We had breakfast and watched as the Red Wings lost a game to the Kings in the play offs. We then returned to the condo and I snorkeled out front of the building but there was not much to see. After cleaning up we went to Sansei Restaurant (a Seafood Restaurant & Sushi Bar) 115 Bay Drive, Kapalua, Maui, HI, phone 808-669-6286. It was excellent, and you get 25% discount if you order between 5:30 and 6:00. 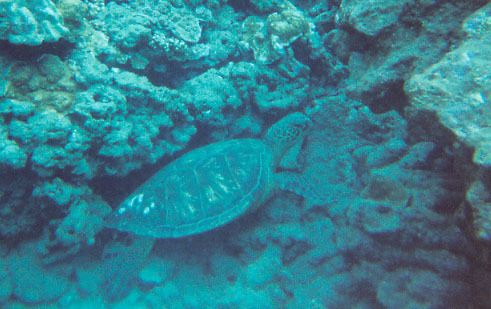 Sun, April 22nd - Went snorkeling at Napili Bay and saw a small turtle and many fish. You had to watch out for the surf at the first reef and go to the second out a little farther. Then we went to Kapalua Bay and snorkeled. The most interesting thing I saw there was a flying gruinard. We then cleaned up and went to lunch at Jamesons Grill & Bar in Kapalua, it was a very nice restaurant with a great view over the Kapalua Golf Club. We then went to Koanapoli and walked around, ending up in The Rusty Harpoon for happy hour and $2.50 mixed drinks. At the end of the day we went to China Boat Restaurant for dinner, it was not exciting at all. 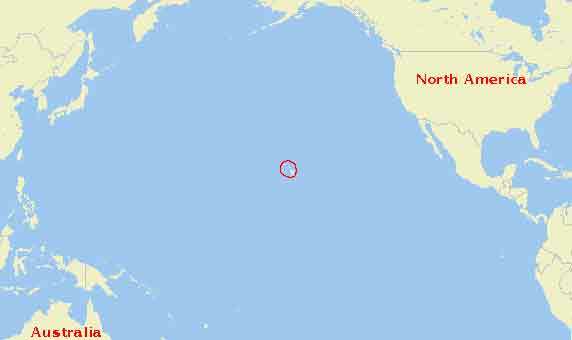 Mon, April 23rd - Went for a walk to Honokowai and bought cookies at the farmers market. We then went back and drove to Lahaina to check out some more shops (I bought two hawaii shirts). I bought a $15 underwater camera that was good for 45 feet and you could reload 35mm film. We stopped for lunch Woodys which had seating upstairs. You could see Moloka'i, Lana'i and Kaho'olawe islands from there. We then drove to Paia on the North Central part of the island and walked around. From there we went to Ho'okipa Beach and watched windsurfers. On to twinfalls (a two mile walk) and back to Sansei Restaurant because it was sooo good. 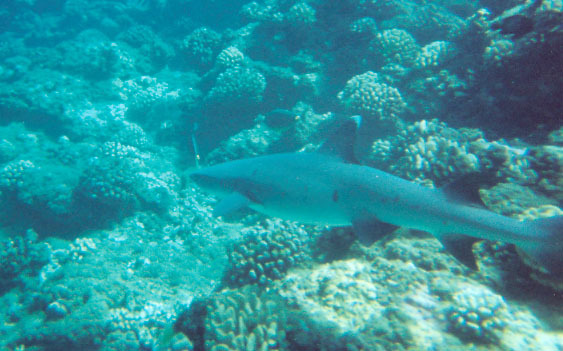 Tue, April 24th - We started the day snorkeling at Olowalu which is south of Lahaina on Route 30, at mile marker 14. Great place to park on the beach and a lot of reef and fish to explore. We snorkeled for about 90 min. and I got to start using my underwater camera. 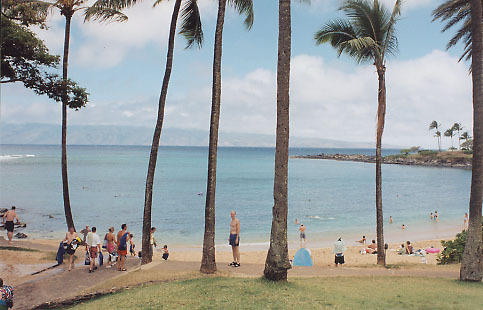 We then packed up and went to the Whalers Village (Kaanapali) to park and snorkeled at "Black Rock" in front of the Sheraton Hotel. We saw a white tipped shark, many fish and as we dove while snorkeling could hear whales singing. We then headed home to clean up and off to eat dinner at Thai Chef restaurant in Lahaina. It was a small place but had good food. We bought a bottle of our own wine there. Wed, April 25th - Another day to explore and snorkel. We went to south-western point of island "La Perouse". The water was stirred up and cloudy so we left and went a little north to "Ahihi Bay". It was much better and a lot of coral and fish. As in many places we saw moorish idols, yellow tangs, etc. and even a flounder. From there we went to "Makena Landing/Five Caves", you had to swim to the right to the third point in the shore and there a reef goes out and we saw four turtles, many fish, and a white mouth moray eel. Back to Kahana Beach to clean up and off to dinner at 6:00 at I/Os in Lahaina. The food was great, they also had a nice view out over the water. It was expensive, $90 for one drink each, shared salad, Ahi & Lamb dinners, chocolate moose and creme bruhlay, but great. 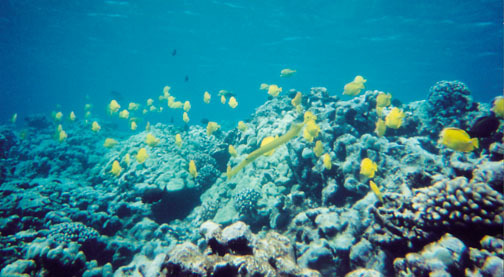 Thur, April 26th - Snorkeling again this time at "Coral Gardens" 6/10th of a mile from Pali tunnel on route 30. No one else was there and it was clear with good coral and fish. We saw one turtle and I took more pictures. Then we went to mile marker 14 again, it was 10:00 and already had a lot of people there. it was cloudy until you went out 200 or more feet from shore. I wanted to try something new, although Lynn was ready for Sansei again, so we went to Eric's Seafood Grotto. I should of gone along with her thought the meals we had were just average. 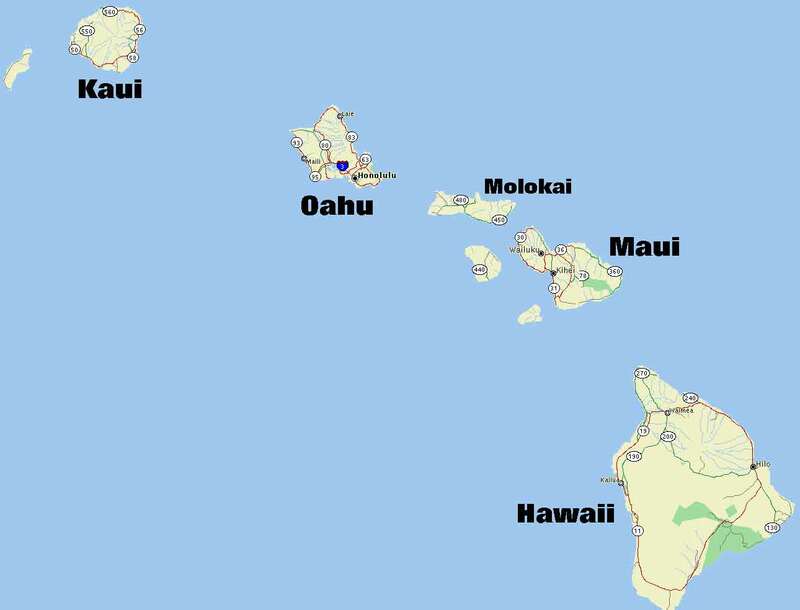 Fri, April 27th - Up to pack to go to Kauai. When we realizing the suitcase was getting heavy, we went to the Lahaina Post Office and bought a box to send 27 lbs worth of overpacking and some souveniers home. It cost us $40 to three day deliver it home. 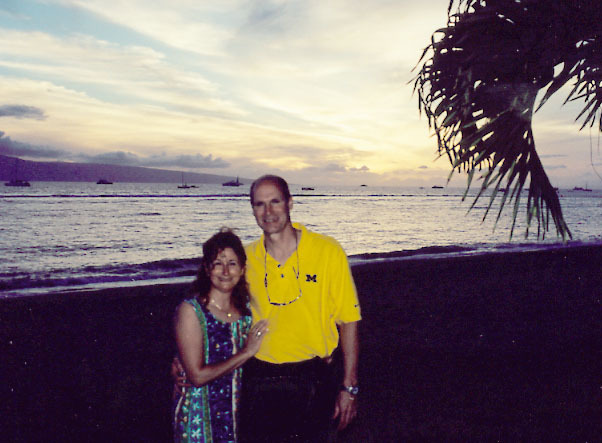 We then made one last trip into Lahaina, sent our son a food care package at school and headed to the airport in Kahului with a couple of stops at scenic overlooks. We flew Aloha Air to Kauai (a 40 min. flight).